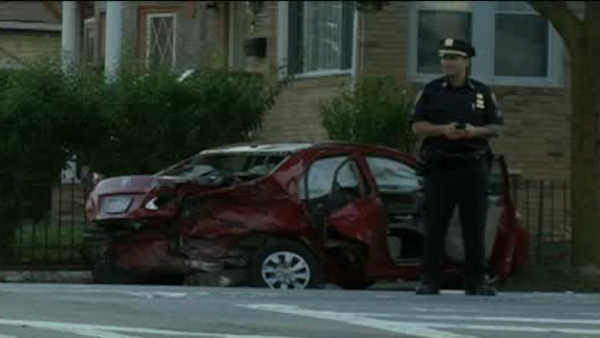 SOUTH OZONE PARK, Queens (WABC) -- Police have made an arrest in connection with an accident in Queens Sunday that left a woman dead and her 9-year-old daughter injured. The NYPD arrested 58-year-old Jairam Budhu of Queens on multiple charges, including manslaughter, criminally negligent homicide, assault and leaving the scene of an accident causing death. Authorities said a black BMW SUV caused the crash in South Ozone Park. Surveillance video shows the SUV speeding as it was traveling westbound on 115th Avenue. According to police, the BMW ignored a stop sign and slammed into a red Toyota Corolla heading north on 130th Street, ejecting the mother and daughter from the car. The woman, 40-year-old Zaalika Rasool, was pinned under the vehicle and died at the scene. Her daughter Sarah was hospitalized in stable condition. Investigators say the BMW hit three parked vehicles before coming to a stop. The driver fled the scene. Rescue crews removed two other people from the Toyota and took a passenger from the BMW to a hospital.